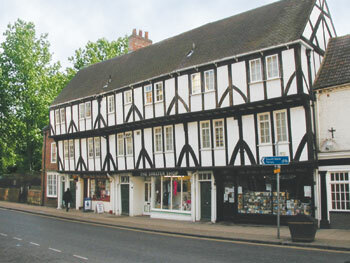 These properties form a timber-framed range containing three separate tenements under one roof, parallel with Micklegate. They were restored in 1967 and without this action would probably not have survived for another ten years. The task was undertaken by Ings Property Company working in co-operation with York Corporation and the then Ministry of Public Building and Works. This group of buildings has always been regarded as one of the most important in the city, and is perhaps one of the best examples of the value of a group as opposed to individual buildings. Structural evidence shows that the division into three was part of the original design; each tenement is of two bays. There is a degree of uncertainty about the date of the houses. John Speed’s map of York, drawn in 1610, shows a gap between Holy Trinity Church and the gateway to the demolished Priory (the site of the present Priory Street). It is in this gap that the houses now stand, and because of Speed’s accepted accuracy it has been felt that the houses must have been built after 1610. But from the point of view of style it is believed that the houses cannot be much later than 1500. An explanation of Speed’s gap is that any attempt to draw the houses between the Priory Church and the gateway would have hidden the portrayal of the conventual buildings which are actually shown. The Royal Commission on Historical Monuments believes the houses to be of late medieval date, pointing out that the double-jettied front, embattled bressumers and crown post roof are features of the late fifteenth or early sixteenth century. It is probable that the range was built for letting as “rents” along the street frontage of the precinct of Holy Trinity Priory at a date well before the Dissolution of the early sixteenth century. Its survival in a comparatively unaltered form may be due - as has been found elsewhere - to its use for the butcher’s trade. No. 85 was occupied by butchers probably from the middle of the eighteenth century, and was certainly so used in 1838 when William Stodart Stoker was assessed on the house and slaughter-house. No. 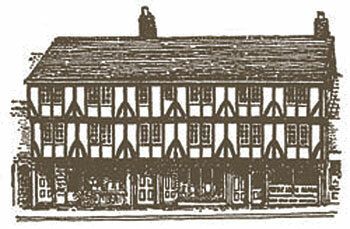 87 was occupied from 1708 by George Chapman, butcher, and his successor in business, and No. 89 was used by the butcher William Pearson between 1777 and 1796. The exposure of the timber framework found general approval, as nearly all the rendering was added after about 1660 to make the houses weatherproof. In the restoration work, insulation board was put on the inner side. In addition to the removal of the rendering, the sash windows were replaced by casements, and the pantiles by plain tiles. Each of the three tenements originally consisted of a single room to each floor, probably subdivided by curtains or thin partitions. All the chimney breasts are of a later date. The late-Victorian shop front of No. 87 replaced a bow window which existed in 1886, according to an illustration in a nineteenth century publication.